Save water costs with this utensil holder from Server Products. 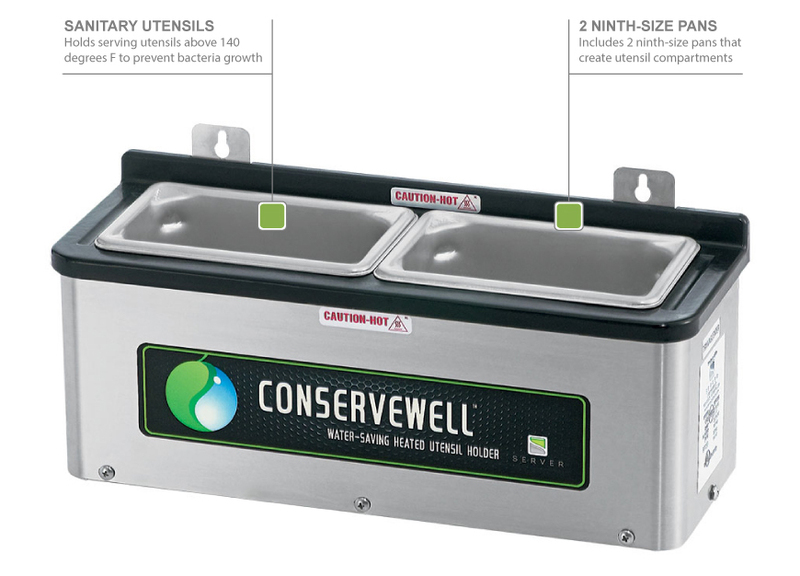 This dipper well keeps utensils above 140 degrees Fahrenheit to restrict bacteria growth without the high water costs of traditional perpetual flow sinks. Key slot mounting brackets make the unit easy to install and easy to remove for cleaning. "It's suppose to hold at 140, but if you have water under the tray inserts, it will throw off the thermostat and heat up to 180. People who are co..."
"I bought one of these for my ice cream shop and attached it to the back of my ice cream dipping cabinet. The other reviewers complain that it get..."
"I use these on the line to keep all our kitchen utensils clean and sanitary. Absolutely recomend these ans the round with digital timers." "It's suppose to hold at 140, but if you have water under the tray inserts, it will throw off the thermostat and heat up to 180. People who are complaining about it being too hot most likely have water under the trays. It took me 2 minutes to call customer service and find this out. Now it's always 140." "I bought one of these for my ice cream shop and attached it to the back of my ice cream dipping cabinet. 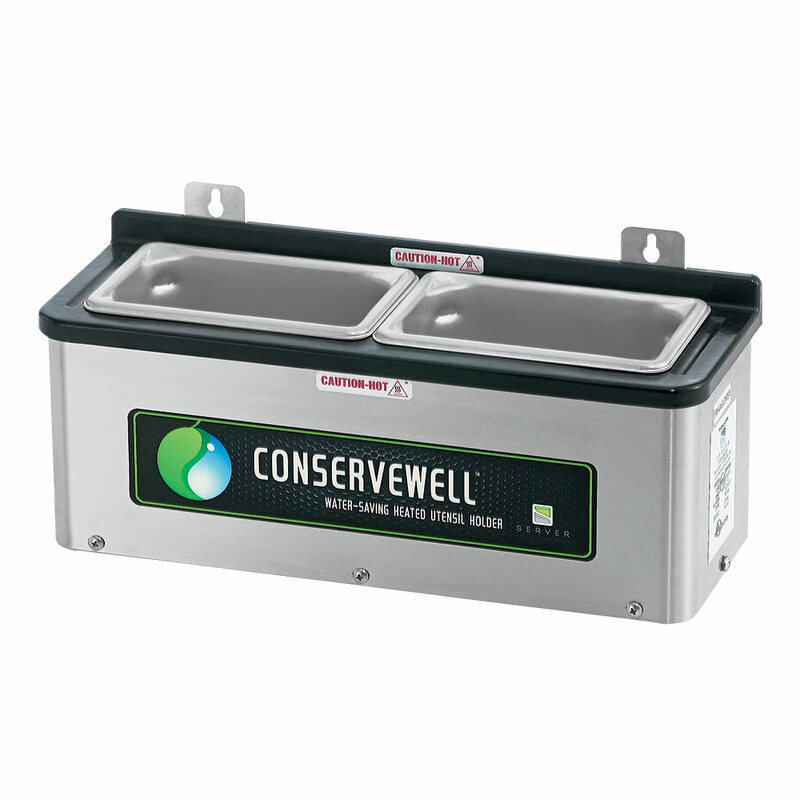 The other reviewers complain that it gets too hot, but the heat is what kills bacteria and keeps your scoops sanitary without the use of running water. Any cooler temp and it wouldn't be food safe. What we do at my business is put our scoops in a separate canister next to this dipper well. After using a scoop, we put it in the well for a few minutes so it has enough time to kill any bacteria while rinsing the scoop and then we take it out while it is still cool enough to handle and put it in the canister next to the well until our next customer arrives. If we have a rush, we just keep rotating the scoops in and out of the well so they are never too hot to handle. It's an easy solution. I also really like this because when you dip in-between scoops, it warms your scoop and makes the ice cream so much easier to scoop. We purchased Ove-Gloves to change the water, but we have found that even simple vinyl food service gloves create enough of a barrier against the heat if you handle the pan inserts by the corners. 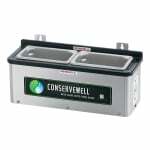 This is also great for conserving on our water bill and a better option environmentally." A must have for all kitchens. "This thing does not work if you use professional / commercial ice cream scoops so what's the point? Two of my employees burned their hands. There's no temperature adjust on the machine. It heats the metal on the scoops up so high that you can't even handle them"
Not good for an ice cream shop. "Bought this so that I wouldn't have to plumb to my dipper well. Wanted to use a Zerroll type scoop, because we like the way they scoop and we don't have to rely on a level to release the ice cream. We are looking for a unicorn. The water in this well is too hot. It is useless." "These are not usable for ice cream scoops. The water gets extremely hot causing the scoops to get very hot! These are not a solution to a continuous flow dipper well." "I purchased this a few months ago and love it since we figured out to start out with very hot water, does anyone have a recommendation for ice cream scoopers? We find they deteriorate in the hot water. Thank you"
"I know this is supposed to be at a temp of 180 degrees which is great but it makes my ice cream scoops extremely hot and unable to handle them without special gloves or a towel. Maybe I need special scoops??? We also have a difficult time changing out the water throughout the day because it gets so extremely hot"